If you’re looking for a traditional lawn game to fill up a summer afternoon, horseshoes could be an excellent choice. All you need is the best horseshoe game set and a buddy to play against (for set up refer to our article about horseshoe pit dimensions) . We can’t help you with the latter but know of some sets you might like. Check them out below. Whether you want to pitch like a pro or enjoy a slow-paced game of horseshoes with your buddies, the St. Pierre American Professional Series is the best horseshoes game set you could come across. It’s designed by a World Champion pitcher and impresses with the unique shape of the shoes. 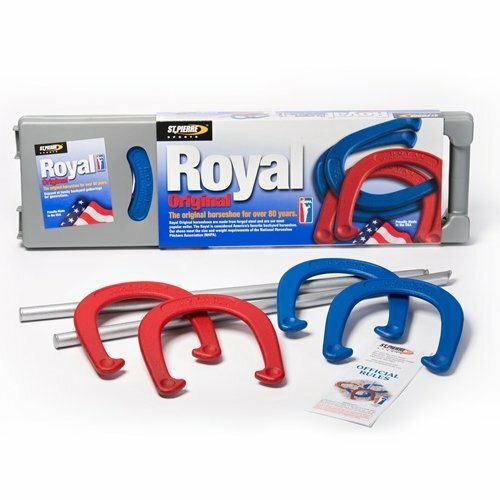 Delivering an excellent value for money, this set comes with four rugged horseshoes made from forged steel and two solid steel stakes covered in anti-rust powder coating that can withstand even the harshest conditions. But the choice of materials isn’t the only great thing about these shoes. What makes them special is the design which concentrates more weight into the tips, improving both balance and control. Approved by the NHPA, the shoes also have a tapered leading edge that makes them slide easier onto the stakes. This horseshoes set is perfect for all players regardless of their level of expertise. It comes complete with an official rulebook and black plastic tote, as well as a convenient 60-day manufacturer warranty. All you could wish from a best in the class pick. If you don’t mind playing with cast-iron horseshoes but would rather save some cash on the game, then this horseshoes sets by Franklin Sports may be the right one for you. Ideal for the weekend warriors but sturdy enough to satisfy the pros, this set boasts regulation size and weight. Two durable steel stakes and the horseshoes painted in blue and grey provide realistic horseshoes experience even if you won’t even leave your backyard. Both the stakes and the shoes are powder coated for a durable finish, while the stakes come with tapered ends for easy placement into the ground. Another great thing is the type of game choice. Whether you want to play by the rule or just enjoy a relaxed horseshoes game with your loved ones, the Franklin Sports set comes in the professional, starter, American, and family variants. The name says it all. 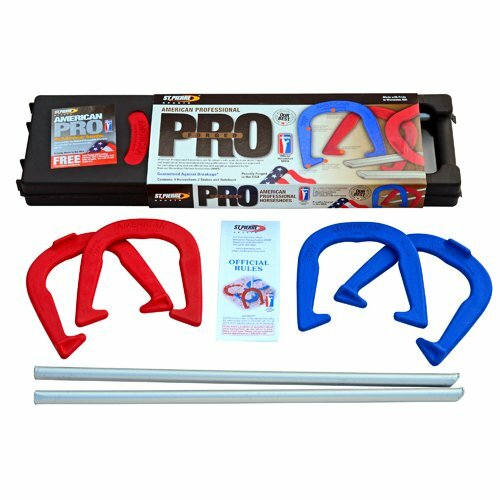 If you’re aiming to play professional horseshoes, the Mustang Professional Pitching Horseshoes Set is the one for you. It’s made from a unique iron alloy that delivers iron’s strength with steel’s properties. Thanks to the composition of the materials, these horseshoes resist deforming, burring, and mushrooming, and will not crack right before you win the tournament. 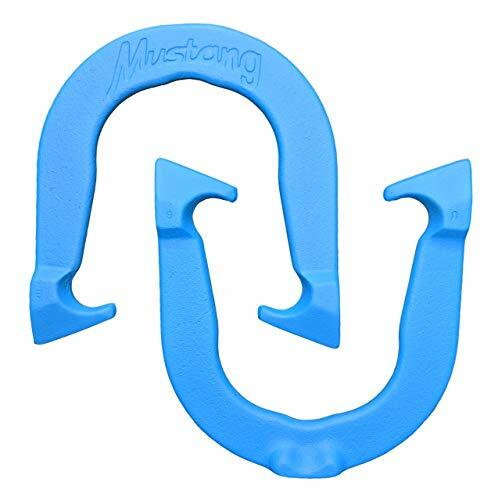 Made in the USA, these horseshoes respect the NHPA regulations for league and tournament use. You will certainly appreciate the official weight of approximately 2.5 pounds of each shoe, as well as the design that is perfect for both flip and turn pitching. It will always end cleats down no matter how you hold it and delivers superb doubles play. Backed by a one-year warranty against breakages, offering a centered notch to the flip pitcher as well as long blades with smooth edges for the turn pitcher, these horseshoes bring the best of both worlds. Undoubtedly, they are perfect for all players who’re looking for more than a backyard type horseshoes. 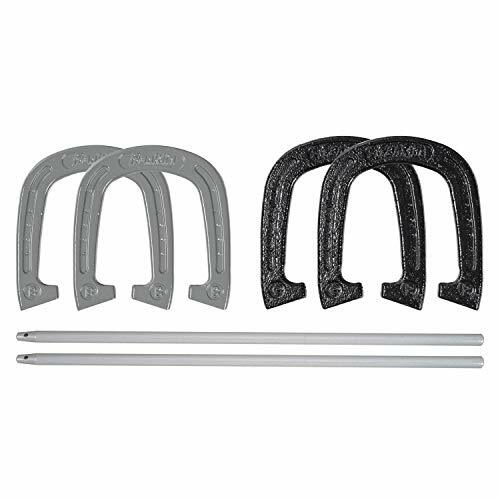 NHPA-approved for official play and coming at a price that won’t break the bank, this horseshoes game set is a great alternative to our professional pick above. It’s similar to our best choice up to a point, and it consists of four durable horseshoes made of steel that come alongside two 24-inch drop-forged steel stakes. Like most St. Pierre sets, this one’s designed by a World Champion pitcher. You’ll be surprised by the weight and balance of these horseshoes that feel like the real deal despite being constructed for the amateurs. Designed to let you pitch like the pros, these shoes even have longer tips as well as a finger positioner. You’ll not only get to improve your gameplay, but you’ll also be able to learn the horseshoe game rules if you don’t know them already, thanks to the official rule book for beginners included in the pack. On top of that, the set also includes a carrying tote for easy transport and storage. 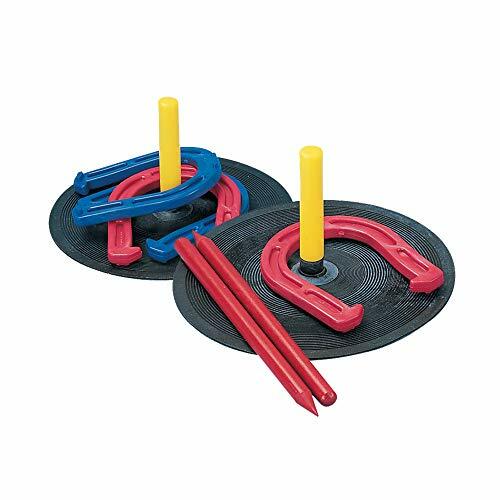 The Champion Sports Rubber Horseshoes Set is more than an excellent budget option. It’s the best option for those attempting to train the next generation of horseshoes player. Made from rubber, this set is family-friendly and perfect for kids. It’s also ideal for getting out of the box and playing in all seasons, either indoors or outdoors. Compared to the traditional horseshoes, these ones are lightweight and easy to handle by youngsters, seniors, or people suffering from various impairments. Another feature that appeals to the younger players is the palette of this set. Bright, vibrant colors can easily catch the attention of the little ones. This set is ideal for players from nine years old onwards and comes with four rubber horseshoes, two ground stakes made of plastic, and two rubber mats with plastic pegs for indoor play. Quick and easy to set up, virtually unbreakable, and friendly for the families, this is the best horseshoe game set for players shopping on a budget or those looking to play with their kids. Getting the best horseshoe game set is essential if you want to become the envy of the neighborhood. While there are many subjective considerations to weigh in, there are also a few objective criteria to consider before buying. The most important thing to weigh in before buying is the type of horseshoes you need. A recreational set is perfect for the weekend warriors who look for a fun pastime. These picnic-style horseshoe sets are fairly inexpensive and usually consist of four shoes, two stakes, and a carrying case. Professional sets come with the same components, but the quality of materials, as well as the shape, weight, and balance of the shoes, make the difference. Both recreational and professional sets are usually designed for adults and come with heavy and potentially hazardous pieces, such as steel or cast iron stakes and shoes. If you want to play with your kids too, rubber horseshoes set could be a more appropriate solution. Rubber horseshoes are also ideal for senior players who find it hard to handle and throw heavy shoes. We truly recommend the professional-style horseshoes, as they offer an unrivaled game experience. They also withstand the test of time, and their quality pays off in the long run. If you want such a set, just look for one marked as NHPA-compliant. Regardless of what type of set you need, you must also check the quality of the shoes included. Although some sets may look very similar at first glance, it takes a closer inspection to understand whether your investment is worth or not. Drop forged steel: Perhaps the most popular and long-lasting material. These shoes are made through the traditional forging process in which metal is hammered into a horseshoe. Some of the highest quality professional sets come with drop forge shoes, but since making these shoes is expensive and time-consuming, it’s unlikely to find them in low-end and mid-range sets. Ductile iron: These are the most inexpensive shoes, often included in recreational sets. The biggest disadvantage of this material is its friability; these shoes are known for breaking easier than those made from steel or alloy. Alloy cast steel: A material stronger than ductile iron and fairly lightweight, it is commonly employed in the construction of pitching horseshoes. It can be used to make a wide range of horseshoes designs for either professional or recreational sets. Sadly though, this material is expensive. Another popular material used in family-friendly sets is rubber. We didn’t include it on the list above since it is never used in the manufacturing of NHPA horseshoes, but it comes with a host of advantages nonetheless. Perhaps the biggest positive trait is its durability. Rubber horseshoes are unlikely to break regardless of how you treat them. These shoes are also lightweight and suitable to use by kids and seniors. Furthermore, you can use them for both indoor and outdoor play, not to mention they are affordable. If you want to pitch like a pro, the weight of the horseshoes is as important as their quality. NHPA shoes must weigh approximately 2.5 pounds, the perfect heft for a balanced toss. Rubber and plastic horseshoes might weigh less, and there can also be slight differences between steel and ductile iron models. Besides the actual weight, you must also consider how it is distributed. Scoring a perfect ring is not all about the throwing technique. If you want to look like a pro on the green, choose horseshoes with the weight concentrated on the arms. Standard horseshoe sets come with four horseshoes and two stakes. Extra features can take the game to the next level though. If you want to play in teams, for instance, you could invest in a horseshoes set that comes with eight shoes instead of four. Most rubber sets come with mats and pegs for indoor play too. Many kids’ sets also include other similar games besides the horseshoes, such as ring toss. Lastly, getting a set that comes with a carrying case solves two issues in one. On the one hand, you’ll have the perfect storage for your game. On the other hand, you’ll be able to take your horseshoes anywhere without worrying about parts going missing. Never leave your horseshoes or stakes outside overnight. Exposing them to elements such as rain and excessive sun can have a negative impact on the materials, causing them to rust or become brittle. When playing on a hard surface, it is recommended to anchor your stakes in wood rather than concrete. This decreases the impact of the horseshoe hitting the stake, prolonging the component’s lifespan. Don’t be afraid to apply a new coat of paint or weather-resistant coating if the original paint on the horseshoes has chipped. Besides protecting the material, the paint can also absorb some of the shocks when the shoe hits the stake. For recreational playing, it is recommended to buy multiple sets of a variety of weights. This will give pitchers the possibility to choose the horseshoes that best suits them, reducing the likelihood of wayward toss. Having a spare set can also come in handy if one of the shoes happens to break while you play. Whether you’re looking for an adult’s horseshoes set or for one suitable for the youngsters, there are dozens of options to choose from. Some of the sets include just the horseshoes and stakes. Others come with carrying totes, rule booklets, and maybe even other accessories. Regardless of what set you need, you now know which are some of your best options and what to consider before buying. All you have to do is pick the one that best suits your needs and gets ready to have some fun this summer.